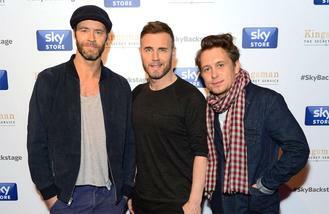 Take That have recorded a dance track with Sigma. The 'Back For Good' hitmakers and the British drum and bass duo - comprised of Joe Lenzie and Cameron Edwards - have teamed up on a song called 'Cry', which could be featured on their next album and sees the Manchester band push "boundaries". A source told The Sun newspaper: "Since their second coming Take That have been more experimental with their music but this really has pushed the boundaries. There's a huge mutual respect between the acts and they are delighted with the end result." As well as working with 'Coming Home' hitmakers Sigma, the trio - Gary Barlow, Mark Owen and Howard Donald - have also reportedly reunited with former bandmate Robbie Williams to write and record a number of tracks for their Greatest Hits album, which will be released next year to celebrate the group's 25th anniversary. A source previously said: "Robbie loves being part of the creative process and he has lots to offer. He influenced the last album he featured on with his electro sound, which reflected his solo work at the time. It will be the first time the 'Rock DJ' singer has written songs with the group since rejoining his former band for 2010's 'Progress' album and subsequent tour. He's also reportedly set to perform live with the group for a huge anniversary tour next year. The boy band started off as a five-piece with Robbie and Jason Orange, but Robbie, 42, originally left in 1995 and then again in 2014. Jason, 45, was part of the original 2005 reunion but walked away from the band in 2014. However, Gary, 45, has stated that both Robbie and Jason, can return to Take That if they want to. He said: "Take That is five people. Exactly when they come back is up to them. That will keep it interesting." Debbie Harry loves the "amazing" song Sia has written for Blondie's new album. Selena Gomez vetoed pal Taylor Swift's idea to reunite their squad on stage for her Revival tour. Gregory Porter says receiving awards is like "being paid to breathe" for him. Lemar will perform with Joss Stone at 'Barnardo's Presents: Joss Stone & Friends' on May 15. Sir Paul McCartney dedicated his entire Minneapolis show on Wednesday night (04.05.16) to "the late great Prince". The Weeknd is working on "magic" new music with the team behind his debut LP 'House of Balloons'. Former Rolling Stones members Bill Wyman and Mick Taylor will perform together at Henley Festival 2016. Demi Lovato knew she had to defend "brave" Kesha after the pop star accused Dr. Luke of abuse.